Bus Driver- Passed Matriculation Exam and HMV Licence with 5 year Experience in Bus/Heavy Vehicle Driving. Statistical Assistant- Passed PG Degree in Statistics/Maths/Economics and 2 Year Experience. Medical Social Worker- Passed MA in Sociology/MSW and 2 Year Experience in Social Work. Radio/Gas/X Ray Mechanic- Passed ITI Certificate in Concerned Trade and 2-3 year Work Experience. Modeller- Passed Diploma/Certificate in Modelling. Lady Superintendent- Passed Degree/Diploma in House Keeping and 2 Year Work Experience. ECG Technician/X Ray Technician/Isotop Scanner/Sr. Radiographer/JMRO/Ventilator Technician- Passed 12th Science and Diploma in Concerned Discipline and 1-5 Year Experience. Museum Caretaker- Passed Degree in Museology or B.Sc Zoology and 2 Year Experience. Audio Visual Technician- Passed B.Sc/BE Electronics or Diploma with 1 Year Experience. Tailor- Passed ITI Certificate in Tailor Course. Secretary to Dean- Passed Graduation and Shorthand Speed. Heavy Vehicle Driver- Passed B.Lib and 5 Year Experience in Bus Driving/Heavy Vehicle. Librarian/Asst Librarian- Passed UG/PG Degree in Library Science and 3-5 Year Experience in Similar Field. Artist- Passed Diploma/Certificate in Fine/Commercial Arts/Modelling. Perfusionist- Passed B.Sc Degree and 5 Year Experience in Perfusion Technology. Radiotherapy Technologist- Passed B.Sc in Radiotherapy/Radiology with 5 Year Experience. Dental Mechanic/Dental Hygienist- Passe Matric and Diploma/Certificate in Concerned Field and Registered in Dental Council. Dark Room Assistant- Passed Matric and Diploma in Radiography. Pharmacist- Passed Matric and Diploma in Pharmacy. Dresser/OT Assistant/Lab Technician- Matric/Diploma in Dresser/OT Assistant/MLT. Receptionist- Passed Graduation in Mass. Comm/Hospital Administration/Hospitality Management. Physiotherapist/Occupational Therapist- Passed 12th Science and graduation in Physiotherapy/ Occupational Therapy. Nursing Superintendent- Passed B.Sc Nursing/B.Sc Nursing Post Basic/B.Sc Post Certificate and Registered with Indian/State Nursing Council. 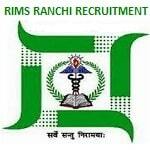 Eligible Candidates can Submit RIMS Grade III Technical & Non Technical Post 2019 Application to the Official Address Latest by 30th April 2019. Click on IIIrd Grade Technical & Non Technical Post Recruitment Advertisement.